Tracklisting / Additional Info: The song was originally featured on the band's 1978 album Jazz, the seventh album by Queen and the first to be recorded outside of the UK for tax purposes. 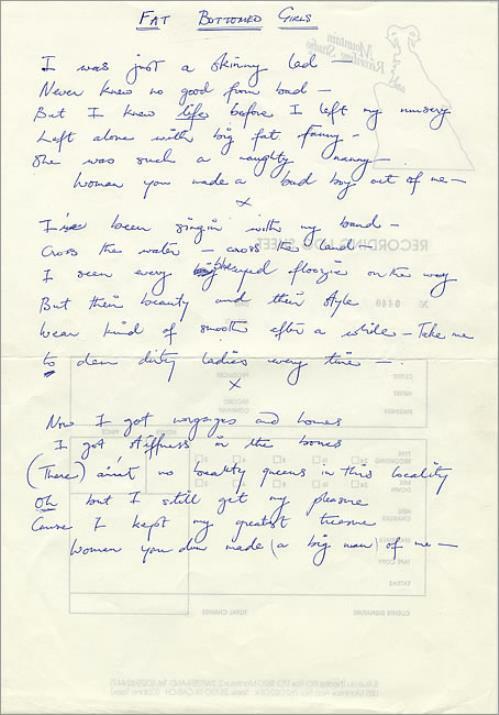 The song and indeed the album was recorded at Mountain Studios in Montreaux, Switzerland and the first page of this important historical artefact is written in blue ballpoint pen on a sheet of Mountain Studios A4 paper. The second page is written on a standard sheet of lined A4 paper. 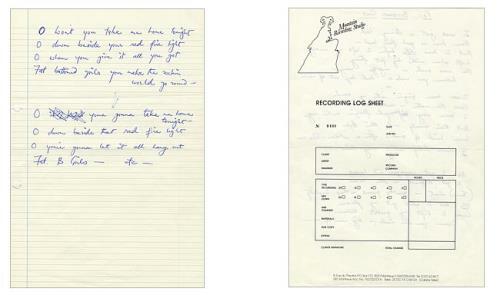 The lyrics themselves are Freddie Mercury's personal copy used in the studio for recording purposes. The song was composed by Brian May but as was commonplace for Freddie he copied the lyrics out in his own unmistakable handwriting as he had trouble reading anyone else's! The lyrics on the sheet have a couple of subtle differences and minor corrections as can be seen in the image - for example 'big eyed floozie' was changed to 'blue eyed floozie' and the 'Heap big' is missing from the line 'Heap big women you made a bad boy out of me'. These lyrics were given away by Freddie as a gift many years ago and they have been verified by Jacky Smith of the Queen International Fan Club as genuine and are accompanied by a Letter Of Authenticity from her in addition to our own. Without doubt a unique piece of Queen history that is made even more desirable by the fact that there have been no documented sales of any Freddie Mercury handwritten lyrics in the last ten years! A museum quality item that deserves to be displayed as the jewel of any collection.